I sometimes have bad luck with grocery shopping. I meal plan each week – and I shop according to that plan. So when I can’t find a key ingredient in a dish – I have to improvise on the spot or try to come up with something else to make. So I knew that my grocery store carried broccoli rabe – since I’ve seen it there before. But this day it didn’t – so I had to substitute broccoli. It may not seem like a huge difference – but they are two different vegetables with different tastes! So next time I find it I will have to try it in this recipe – since we both really liked it. I was actually surprised at how flavorful and delicious this meal turned out to be! 3. Bring a large pot of salted water to a rolling boil. Cook the broccoli (2-3 minutes) or broccoli rabe (5-7 minutes) in the boiling water. Remove with a slotted spoon when done and cook the pasta according to the package directions. 4. Meanwhile, heat the 1 Tbsp. oil in a large skillet over medium-low heat. 5. Add the garlic and cook until it begins to sizzle, about a minute; add the sausage and red pepper flakes and continue cooking until nicely browned, 5 to 7 minutes. 6. 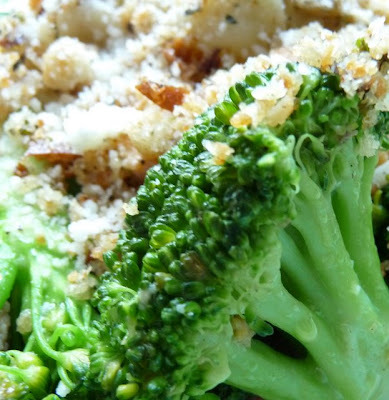 Transfer the broccoli to the skillet. Cook over medium-high heat, adding some of the pasta water as needed to help soften the broccoli. 7. Remove the pasta when it is barely al dente, drain, reserving about a cup of the cooking water. 8. Add the pasta to the skillet with the broccoli and sausage and a couple of tablespoons of the reserved cooking water as needed; toss with until well combined. Season with salt and pepper. 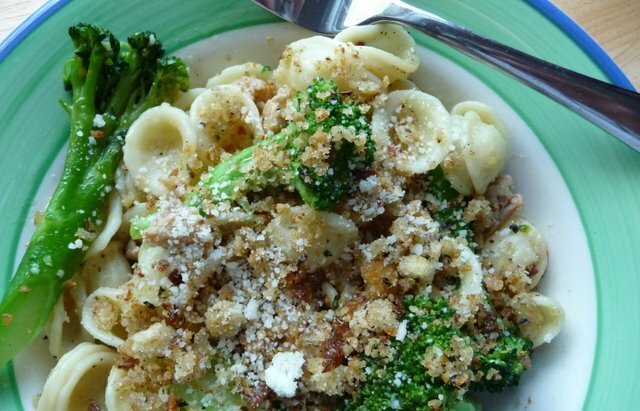 Top with breadcrumbs and parmesan cheese, as desired.